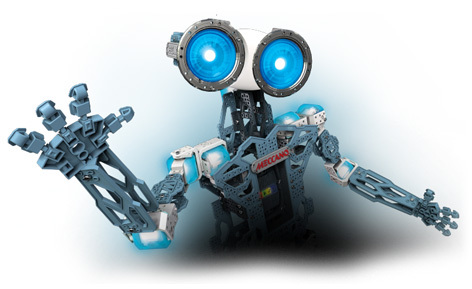 Meccanoid G15 KS robot is probably the most sophisticated Meccano set ever devised. Standing almost 4 feet tall when constructed, the lightweight polycarbonate parts are fully compatible with any other classic Meccano piece ever made. This allows for fantastic customisation, although the serious business end of this monster set is in its fully programmable features. The supplied simple software design option is called “LIM” – short for Learned Intelligent Movement. This easy-to-use system is specially designed to introduce kids to the incredible world of computer programming. This can be enhanced by the iOS or Android interface that allows the addition of a smart phone into a special module. Using Bluetooth via the device camera, the Motion Capture software enables kids to make Meccanoid copy their every movement. Over 100 pre-programmed voice commands are included from the start, and users can add their own as they go along. Re-chargeable batteries and 64Mb of flash memory are also standard features. 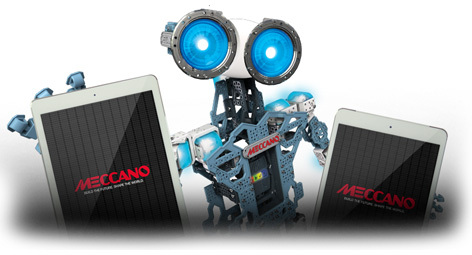 Using the tag line “Build The Future, Shape The World”, Meccano are aiming this set firmly at kids who have their sights firmly set on a scientific or engineering career. The huge expressive eyes have over 500 different colours to choose from, whilst the smart servo motors are used to create realistic elbow, shoulder and neck movements. Motors are also incorporated into the feet to enable the Meccanoid G15 KS robot to achieve a lumbering type walking motion. Please tell us what you think of the Meccanoid G15 KS by Spin Master.